Getting rid of debt is a goal that many people have and yet so many have a problem getting it done. One reason is that it can be overwhelming to find the right place to start. Should you go for the debt with the highest interest or should you start with the lowest balance? As more and more companies are offering help, I thought I would review a tool that is currently gaining some traction in the personal finance industry and fans of its service –Ready for Zero. Basically Ready for Zero helps users take all of their debts and helps them organize and manage them online on one site. Once you sign up, you can get all of that data pulled in and create a personalized plan to get you out of debt faster. If you are looking for a ‘debt relief who negotiates with your creditors on your behalf, Ready for Zero is not your spot. They have the online tools that can help you create a sustainable plan. The free option is a wonderful tool, I’m using it for paying down the student loan during The Debt Movement. For those needed more assistance with managing their debts, there are two paid options – Ready for Zero Plus ($4.99/month) and Ready for Zero Plus Bi-Weekly ($4.99/month plus a one time $50 set up fee). Ready for Zero is pretty straightforward when it comes to how it works. Grab all of your accounts into one spot. When you sign up, you can go ahead and link all of your debts into one spot and quickly see all the necessary information about your accounts, like the balances, interest rates, and payments. Create a realistic debt reduction plan. Using the data given along with the online tools you can find the optimal monthly payments you need to make to reach your goals. Make payments on your debts. Follow your personalize plan and track your progress online or with Ready for Zero’s mobile app. Reach your goals. Stick to the plan and watch your debts decrease and eventually be paid off. It took me about 5 minutes to get my account started. 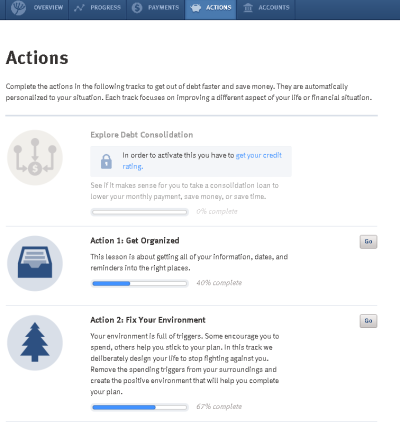 With your personalized plan, Ready for Zero includes suggestions on how you can save money which can then be used to pay down your debts faster (this is one way they make money). They have also partnered up with LendingClub to offer loan consolidation to get a lower rate for some users. Who Is Ready for Zero For? I think if you are someone who is sick and tired of being in debt and want to come up with a plan that you can keep, the Ready for Zero is a fantastic tool for you. Whether you go for the free or paid option, you can get your finances squared away. In addition to the resources they have on their own site, Ready for Zero has many partners, including Steve Rhode from Get Out of Debt who can answer your financial questions. Ready for Zero provides the tools to help those motivated to get rid of their debt. I know there a lot of people who would like to get out of debt, but don’t know where to start. I think Ready for Zero can be a great option for them. While the paid versions have their benefits, I recommend trying their free option first. I have found it quite handy and perfect for my needs. If you’d like to try it out, you can sign up for an account with Ready for Zero today.